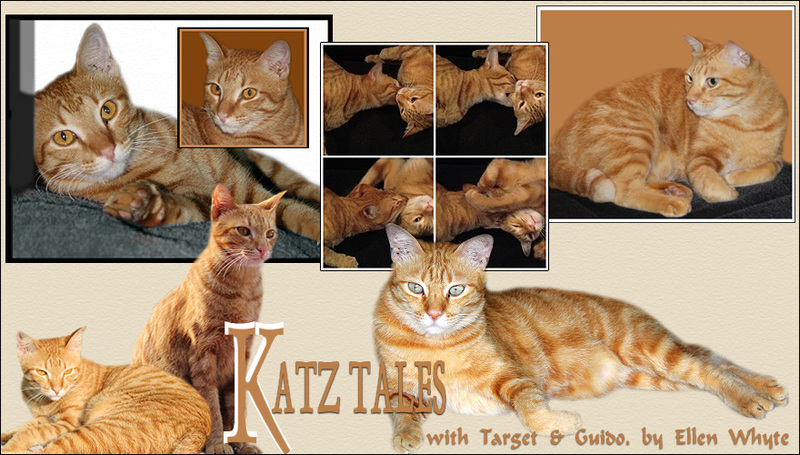 Katz And Other Tales: Market Day! Saturday is Wet Market Day when I go to see what's interesting at our local market. 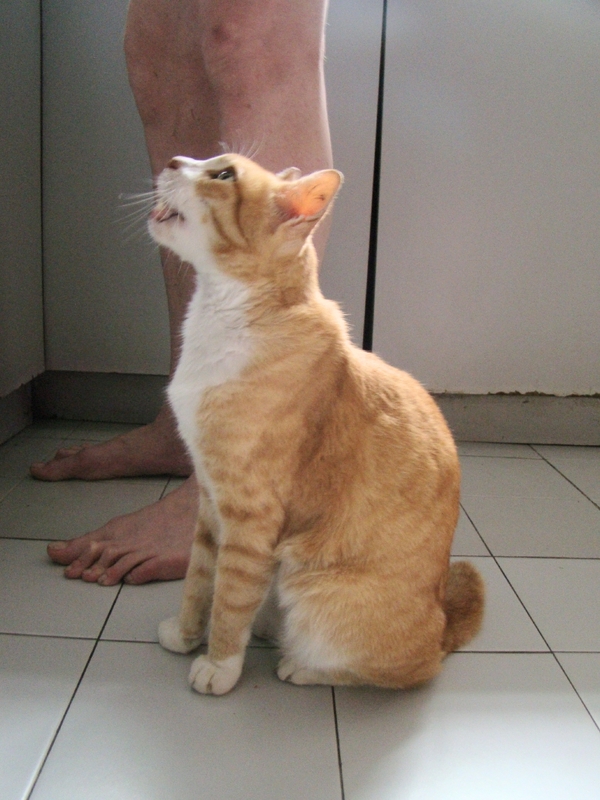 The cats enjoy this day because it means they get fresh roast chicken for lunch! Every Saturday runs in exactly the same way as the one before it. Au will start shouting, "Is it ready yet?" as soon as the chicken goes into the oven. While T-man carves, Au stands by his side and meows loudly. He is a firm believer in that the more you meow, the faster you get lunch. And when it's ready Target will push his face into Au's bowl as he's too impatient to wait for his own bowl to be filled. Guido will hang back and eat later in the day. He's not a lunching cat; Guido is a breakfast kitty. What are you eating today? Wishing all you cat and dogs out there a whole roast chicken! PS to see our secret thoughts, run your mouse over the images. PPS We're going to be on and offline over the next 10 days or so. Bear with us please! All Will Be Revealed 1st June! I don't blame you for being impatient. Fresh roast chicken sounds good! ok now where is my honey roasted chicken? I would like some roast chicken right now! I can not let my cats read your blog; they don't get fresh chicken and they don't need any ideas for an insurrection. 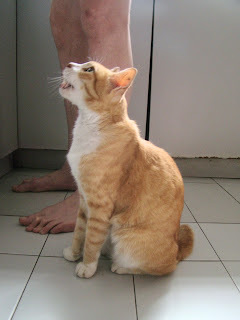 Love the pic of gorgeous Au demanding food now! LOL! Excellent! Mommy needs to feed ME the same thing. I will insist!!!! What a yummy day! See you soon! We all love chicken too. Well, Phantom is weird, he likes to have the chicken if Dad feeds him from the dinner plate, but he won't eat the very same chicken if Mom puts it in his own bowl - he really is a strange and picky boy. I like the concept of the more you meow, the faster lunch is. Way to go, Au. purrr....meow! Roast chikkun is certainly worth shouting about! Our lousy Mommy doesn't eat meat. Au, you look so darn GOOD and healthy--HURRAH! Never is fast enough, right? Fresh roast chicken for lunch! Yum!! Roast chicken sounds yummy! We sure wish we could have some!! Roast chicken on Saturdays! What a great idea! Mommy and Daddy goes and sells at the Farm market on Saturdays May -October, me thinks Chicken would be a better idea! Has fun during your time off! Can't wait to see what your time off reveals!! Can't wait for 1st June! It must be a small world because I had chicken last night as well. My cats had their favorite kibble. But they got a little whipping cream as a special treat yesterday. I wish the boys would eat human meat. They seem to like the smell, but don't get what to do with it. Except Nicki might eat a tiny piece of deli ham once in a while. Otherwise, nada. Looking forward to the big reveal on June 1st! How yummy! Fresh roast chicken for everyone :-) You have such a great Mommy. Cheops has been feeling under the weather and will be going back to the vet tomorrow.